Singapore's factory output has inched its way back into positive territory, although economists do not seem too impressed by the rebound. The manufacturing sector clocked 0.7 per cent year-on-year growth in February, the Economic Development Board (EDB) said on Tuesday. The numbers bucked watchers' fears of two straight months of decline. A Bloomberg poll had guided for a median dip of 0.4 per cent. Last month's production figures were a mild recovery from the contraction in January, which was revised upwards from a preliminary 3.1 per cent to a more moderate 0.4 per cent. Still, February's performance was led by the 13.3 per cent surge in biomedical production, as a fresh mix of active pharmaceutical ingredients boosted drugmakers' output levels. With this cluster left out, overall output fell by 1.6 per cent year on year. On a seasonally adjusted, monthly basis, factory output was actually down by 4.1 per cent, or 0.1 per cent without biomedical manufacturing. Economist Tan Khay Boon, senior lecturer at SIM Global Education, remarked: "The mild increase in manufacturing output year on year and decline in output month on month shows that the manufacturing sector is not out of the woods yet. In fact, the increase in output was buoyed by the expansion in the pharmaceuticals segment, which is a highly volatile and not sustainable segment." 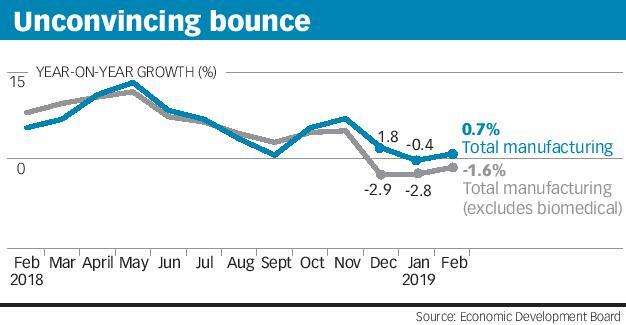 In the precision engineering cluster, which has been in a tailspin since last November, output tumbled by 14.9 per cent, as a drop in semiconductor equipment pulled down the machinery and systems segment. Meanwhile, electronics clocked its third straight month of decline, although the fall has eased to 1.1 per cent from 4 per cent in January. The key semiconductor segment registered tepid growth of 1.1 per cent, after posting declines for two months. United Overseas Bank economist Barnabas Gan pointed to these two clusters' performance as a red flag. "The contraction in growth pace in these industries suggests to us that the ongoing fading technology boom, which contributed to lower electronic-related export demand in Singapore's key trading partners, are key drivers that may inject further headwinds," he said. Maybank Kim Eng economists Chua Hak Bin and Lee Ju Ye, who called the bounce in February factory figures "unconvincing", also warned that the Purchasing Managers' Index sentiment gauges in Singapore and the region are still in contraction, "hurt by the US-China trade war and faltering global electronics demand". The chemicals cluster's output rose by 2 per cent in February, despite the impact of plant maintenance shutdowns on petroleum, speciality chemicals and petrochemicals, as higher fragrances production gave a lift to the "other chemicals" segment. Meanwhile, transport engineering added 4.2 per cent, against 10.4 per cent growth in January, while general manufacturing was up by 4.1 per cent, easing from 4.6 per cent before. Dr Chua and Ms Lee remarked that "transport engineering is showing signs of fatigue, as marine and offshore declined for the first time in a year", with fewer offshore projects and shipbuilding and repair jobs. Dr Tay added: "The heavyweight electronics cluster is still at a declining stage, and without a significant surge in oil prices, the output from the marine and offshore engineering segment will remain lethargic." In a vote of no-confidence for upcoming March numbers, Selena Ling, head of treasury research and strategy at OCBC Bank, estimated that factory output is set to slip by 0.5 per cent in the first quarter of the year. Dr Chua and Ms Lee went further, predicting that the slump in Singapore manufacturing will continue through the first six months of the year, "as the US-China trade war and faltering electronics demand continue to weigh on exports and investments". But UOB's Mr Gan, describing his position as "cautiously optimistic", held to a full-year forecast of 3 per cent growth in industrial production. "Singapore's industrial production grew by an encouraging 0.11 per cent year on year in the first two months" despite a high base of 12 per cent growth in the previous period, he said. Mr Gan added: "The small but positive growth production pace in semiconductors, coupled with the upward revision in January's electronic growth, is a consolation to Singapore's overall economic growth momentum, even in the midst of a sustained manufacturing and trade slowdown in most Asian economies." Singapore exports surprised in February with 4.9 per cent growth, although analysts cautioned that the apparent recovery from January's plunge had come on a low base effect.